It’s no big reveal that, when a basketball team doesn’t shoot well, very little looks good about their performance. It just has an overarching effect, even if it’s only a perceived one. 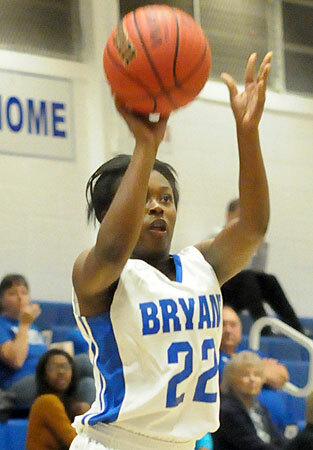 In their hope opener on Tuesday night, the Bryant Lady Hornets just didn’t shoot well at all, particularly early. And, as an inexperienced team, that just gnawed away on their confidence. It just kind of snowballed in the first half and the Greenbrier Lady Panthers took advantage, racing out to a 22-2 lead before Raven Loveless scored off an offensive rebound with 2:12 left in the half for Bryant’s first field goal. 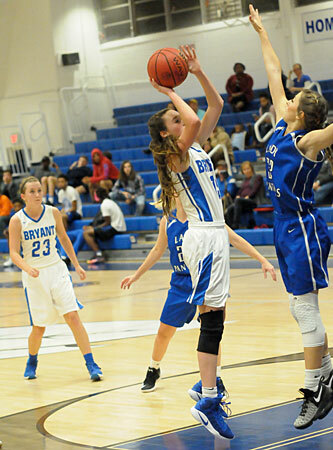 Though the Lady Hornets played better in the second half — outscoring Greenbrier 22-21 — the hole proved too deep to dig out of as the Lady Panthers came away with a 44-29 win. 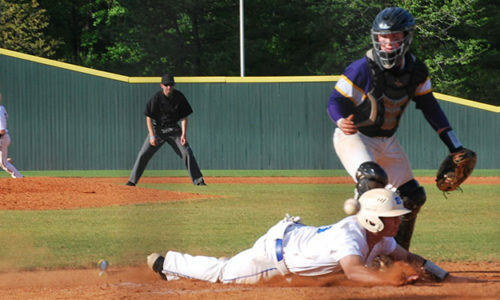 “Offensively, we were not very good,” said Bryant coach Brad Matthews. “I thought we executed okay at times. When we did execute, we missed some makeable shots. Shots that we work to get, just weren’t going down tonight. 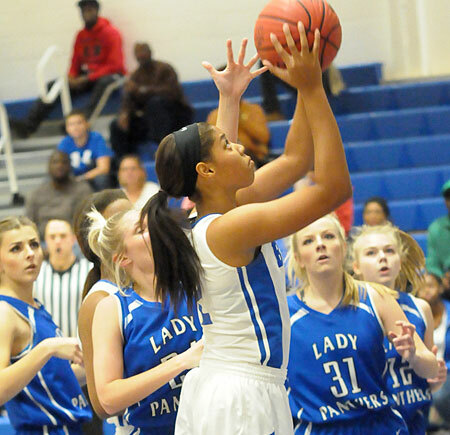 Though the Lady Hornets were 9 of 45 from the field (20 percent) and 9 of 23 from the free-throw line (39 percent) including 3 of 14 in the first half, they forced 17 turnovers and out-rebounded the Lady Panthers 36-22. Loveless finished with 12 points and nine rebounds. Kelly Williams added 7 points, all in the third quarter and Kendal Rogers added 5 points and five boards. Blysse Harmon came off the bench to lead Greenbrier with 13 points including 8 in the first quarter with a pair of 3’s. Sarah McGee added 10. For the game, Greenbrier was knocking down shots, hitting 13 of 23 shots from the field (57 percent) for the game. The Lady Panthers scored the first 6 points of the game before Loveless hit two free throws at the 3:02 mark of the opening period. Greenbrier ended the quarter on a 10-0 run that was extended to 16 as the second stanza unfolded. Loveless’ basket was followed up by Allison Steen’s free throw. In the final minute of the half, Loveless scored inside off an inbounds play and was fouled. Though she missed the free throw, she got the rebound. She missed a follow-up but Kalia Walker scrambled after the loose ball. She got it to Steen who was fouled but was unable to convert at the free-throw line. It was 23-7 at the half. To start the third quarter, Williams got hot with a triple off a drive-and-kick move by Rogers. Rogers and Riley Hill combined to force a turnover that led to a layup for Williams. That trimmed the margin to 23-12 and forced a Greenbrier timeout. But, when play resumed, Kayli Nick got the Lady Panthers back on track with a 3. Harmon nailed a triple and was fouled moments later. 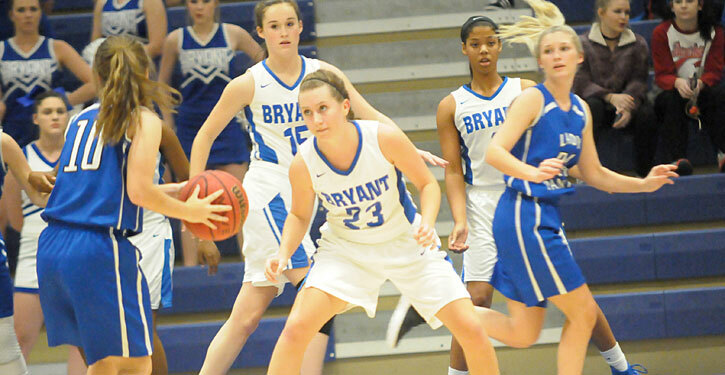 She completed the four-point play and, after a Bryant turnover, added another free throw for a 31-12 advantage. Williams made a steal and layup to interrupt the blitz but it was 32-14 going into the final period. Nick hit a 3 to extend the margin at the start of the fourth quarter. That started an 11-2 run interrupted only by a pair of free throws by Robyn Gordon. So the margin grew to 43-16. After a timeout with 5:23 left, the Lady Hornets mounted a surge ignited by Rogers’ 3. Bryant ended the game on a 13-1 run. Loveless had 6 of her points during the push. 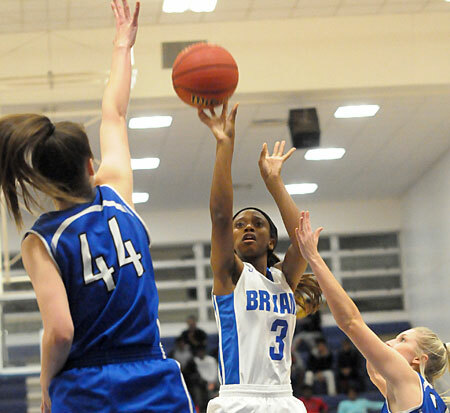 Rogers added a layup and Lania Ratliff finished off the scoring with a jumper in the lane, setting the final score. The Lady Hornets travel to Bentonville for the Crabtree Classic. 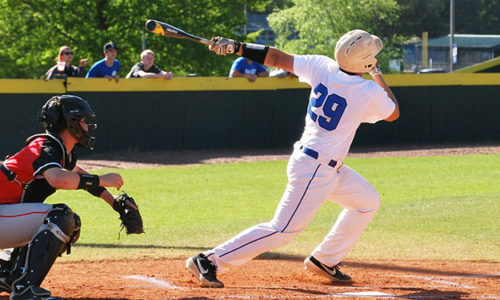 They’ll take on Clarksville on Thursday at 3:30 p.m., then take on Bentonville Friday at 6 p.m., before finishing up on Saturday morning at 8 a.m., against Wynne. Knowles 0-0 1-2 1, Simmons 1-3 3-4 5, Donham 0-2 2-2 2, A.Harmon 2-4 0-3 4, McGee 3-6 4-5 10, B.Harmon 4-5 2-3 13, Glover 1-1 1-3 3, Nick 2-2 0-0 6, Gilpin 0-0 0-0 0. Totals 13-23 13-22 44. Loveless 3-9 6-10 12, Ratliff 1-3 0-0 2, Williams 3-8 0-0 7, Hill 0-3 0-0 0, Rogers 2-5 0-1 5, Gordon 0-0 2-2 2, Rayford 0-2 0-2 2, Walker 0-6 0-0 0, Selig 0-6 0-2 0, Steen 0-3 1-6 1, Adams 0-0 0-0 0. Totals 9-45 9-23 29. Three-point field goals: Bryant 2-12 (Williams 1-4, Rogers 1-1, Hill 0-3, Walker 0-3, Rayford 0-1), Greenbrier 5-8 (B.Harmon 3-3, Nick 2-2, Donham 0-2, Simmons 0-1). Turnovers: Bryant 14, Greenbrier 17. Rebounds: Bryant 27-9 36 (Loveless 8-1 9, Rogers 3-2 5, Selig 4-1 5, Steen 2-1 3, Walker 2-1 3, Gordon 1-1 2, Ratliff 1-0 1, Hill 1-0 1, team 5-2 7), Greenbrier 5-8 (B.Harmon 3-3, Nick 2-2, Donham 0-2, Simmons 0-1). Team fouls: Bryant 18, Greenbrier 19.